On March 9, a sculpture was unveiled on the front lawn of the Cherry Hill Public Library. Many who see this work of art as they drive past it on Kings Highway may think this is a new addition to the library. However, this piece of art, named simply the Greenamyer Sculpture, has actually been at the library for nearly 50 years. For many years, Cherry Hill resident Jenny Porter was an avid volunteer with the Cherry Hill Public Library. She served for a time as president of the Cherry Hill Public Library Board in the 1960s. Not only did Porter love being at the library, but her daughter, Valerie, did as well. “Valerie was an avid reader and had loved the library,” current library director Laverene Mann said in telling the story. In 1966, at the age of 13, Valerie died suddenly of a neurological condition. To honor her memory, Porter asked if the family could have a sculpture commissioned and placed in the library. George Greenamyer, a sculptor who today has dozens of works on display in different areas of the United States, was commissioned to do the piece. It was the first public artwork for which Greenamyer was commissioned. 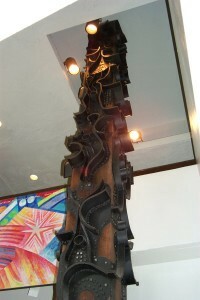 The original sculpture was on a large, 14-foot totem pole and consisted of numerous abstract pieces. Fred Adelson, a Cherry Hill resident and art history professor at Rowan University, admired the piece. The sculpture remained in the library for more than 35 years. However, its future became uncertain in 2004. Sally Callaghan was volunteering to help the Cherry Hill Public Library move its materials from the old building to the new, current building next door in 2004. During the process, she remembers looking at the Greenamyer Sculpture and wondering what the library was planning to do with it during the move. As it turns out, there was no plan for the sculpture in the new building. “I became involved because I was originally the one that went to town hall and found there was no plan for a sculpture of any kind,” she added. Callaghan realized the sculpture had to be saved prior to the old library building’s demolition. She got in contact with the Porter family, who paid to have the sculpture professionally dismantled. Upon moving to the new library building, the deconstructed sculpture was stored in the basement. A group of local residents that included Callaghan, Adelson, Sybil Kleinfeld and Nick Burpulis decided to unite and try to get the sculpture erected at the library again. “We became great friends over the years,” Callaghan said. Multiple times, the group asked library officials if the sculpture could be reconstructed. However, the cost of the reconstruction was a huge hurdle. The group of four worked on getting other pieces of public art constructed in Cherry Hill. Adelson helped give the “Sunday Morning” sculpture by J. Seward Johnson its permanent home outside the library. 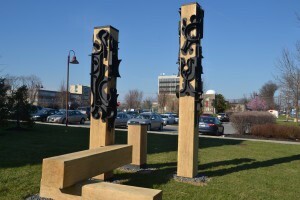 Callaghan did the same with another library sculpture, “Totem,” by David Ascalon. The group was also instrumental in bringing the Free Wheel sculpture to Croft Farm. Despite the group’s work, it wasn’t until recently when its dream to bring the Greenamyer Sculpture out of hibernation became a reality. Movement on reconstructing the sculpture began to happen when the four-person committee proposed to have the sculpture placed outside the new building. A few years ago, Burpulis created a site plan for the proposal. “We took it from the Cherry Hill Library Board and told them where we wanted it to be placed,” Callaghan said. While library officials were receptive to the plan, money remained an issue. The estimated cost of the reconstruction was $20,000. “It was going to be a significant amount of money for an artist to take it and transform it into an outdoor piece,” Mann said. To help fund the piece, Callaghan spoke to Jenny Porter about ways they could pay for the reconstruction. The money was released, allowing for the reconstruction to go forward. Ascalon was asked to reconstruct the sculpture after getting permission from Greenamyer. He re-imagined it, with the black abstract pieces being placed on three different shaped totem poles. Some of the formerly sharp edges of the pieces were also removed. “It’s about shape, it’s about movement, it’s about use of materials,” he added. Adelson feels the reconstructed sculpture has the potential to be a civic landmark because of its uniqueness and highly visible location. “I love the fact that you can happen upon it now as you drive up and down Kings Highway,” he said. While the committee that fought for many years to have the sculpture reconstructed was happy to see it back in public view, not everyone made it to the unveiling. Burpulis passed away in 2012, and Jenny Porter died just a couple months ago at the age of 92. Adelson is hoping people will view the sculpture and not only remember Valerie, but also Jenny and her dedication to the library. “It’s an amazing accomplishment to see it finally re-installed,” he said.